Description: 11 vibrantly coloured bands. 11 matching coloured swivels or button stoppers. 5 different coloured leak proof screw lids. Mix and match your desired colour combination with endless options. 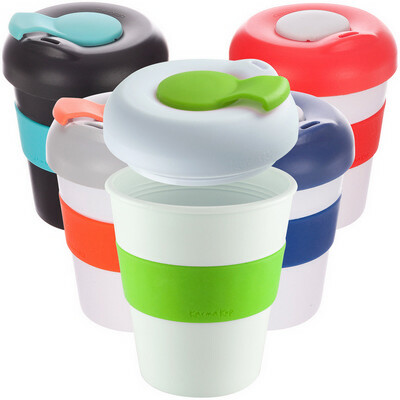 320ml / 11oz BPA free and non toxic plastic cups. Dishwasher safe. Stocked locally for fast turnarounds. Available Silicon Band and Swivel/Button Colours: Black, White, Yellow (PMS109), Orange (PMS021), Red (PMS485), Pink (PMS197), Purple (PMS268), Green (PMS368), Turquoise (PMS326), Blue (Process Cyan), Navy (PMS288). Available Lid Colours: Black, White, Grey (PMS423), Navy (PMS288), Red (PMS485). Product Size: 105 x 90mm. Product Packing: Bulk packed with bands on cups, Lids packed separtely. Decoration Size: Band 60 x 20mm, Upper Side 35 x 15mm, Lower Side 25 x 25mm. Decoration Position: Band, Cup, swivel stopper or button. Decoration Method: Pad Print. Carton Quantities: 200 (Lids) / 100 (Cups) Packed Serperately. Carton Size: 51 x 40 x 33. Carton Weight: 10. Colour: Black | White. Price includes : Pad Print 1 Colour / 1 Position. Setup is included.